The natural light consists of a mix of wavelengths spanning the spectrum from infrared to ultraviolet. The light that has passed through a lens is dispersed, with the different wavelengths coming to focus at different distances from the lens. This phenomenon is increasingly pronounced as the focal length becomes greater, resulting in color shift and blurred images. The 250mm lens uses a newly developed optical glass which possesses a low refractive index and low dispersion characteristics to virtually eliminate chromatic aberration inherent to the telephoto lens. Due to its superb image-forming ability, it is a telephoto lens of choice for professionals who demand the highest picture quality. 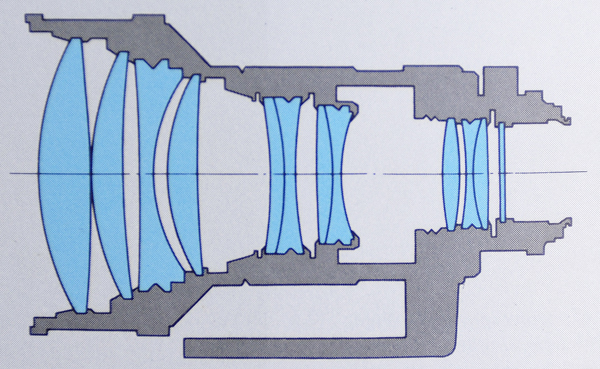 It has a maximum aperture of F2 (the fastest among the lenses in its class). A rotating cam is incorporated (inner focus) to enable the photographer to focus the lens with ease by turning the focusing ring lightly with a finger tip to capture any picture-taking opportunity. The inner focusing also enables him to shoot at close distances down to 2.2m (7.2 ft.). For sports and news photos as well as for shooting wildlife, this lens will freighten picture-taking possibilities even in unfavorable conditions.